I ran a new PR of 19:50 (clock time) with mile splits of 6:37, 6:26, and 6:18 respectively. I placed 9th overall (out of 231) and 2nd in the 25-29 age group. I was back and forth on whether or not I wanted to run the Downtown Sundown 5k, primarily because Michelle and I had discussed just enjoying the parent event itself, the Summer Solstice Fest. 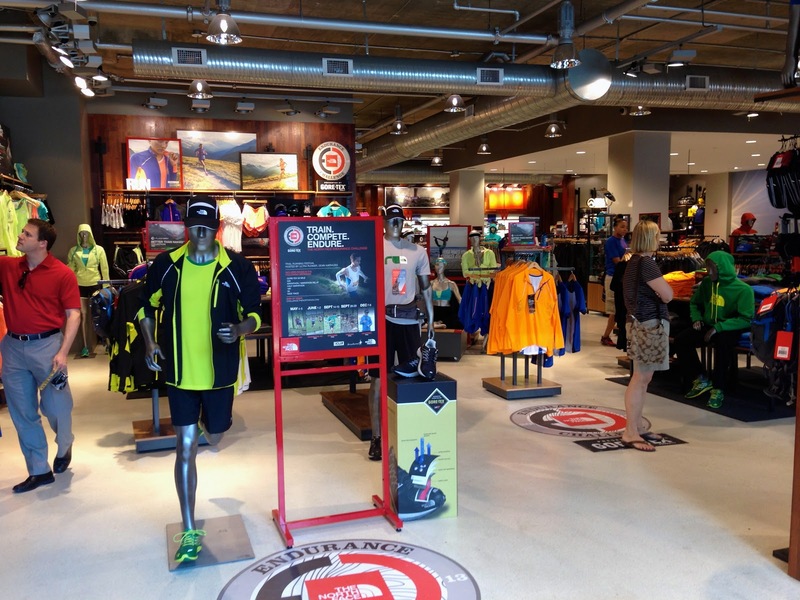 Maybe it was race registration withdraw or the thought of "missing out" as I watched everyone run by but on Monday evening I decided I wanted to run and turned in my registration at RunAbout Sports on Tuesday. 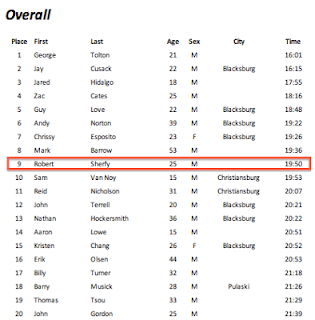 I think the last time I ran a 5k was during my undergraduate time at Tech in the 5KD (2008?!?). My running last week was pretty low, in fact it was only three runs aside the race on Saturday so I think I was well rested. On Friday, Michelle and I headed off to to grocery store and on our way stopped by the Dollar Tree so that I could pick up a few birthday cards. 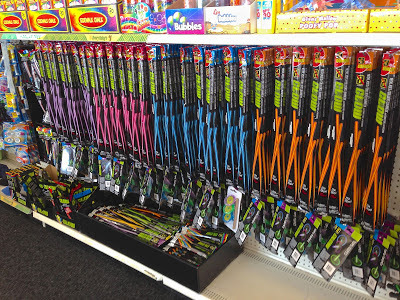 Upon entering the store, I completely forgot why we were there because I was so distracted by their massive selection of glow-in-the-dark products. I may have gotten a little carried away. 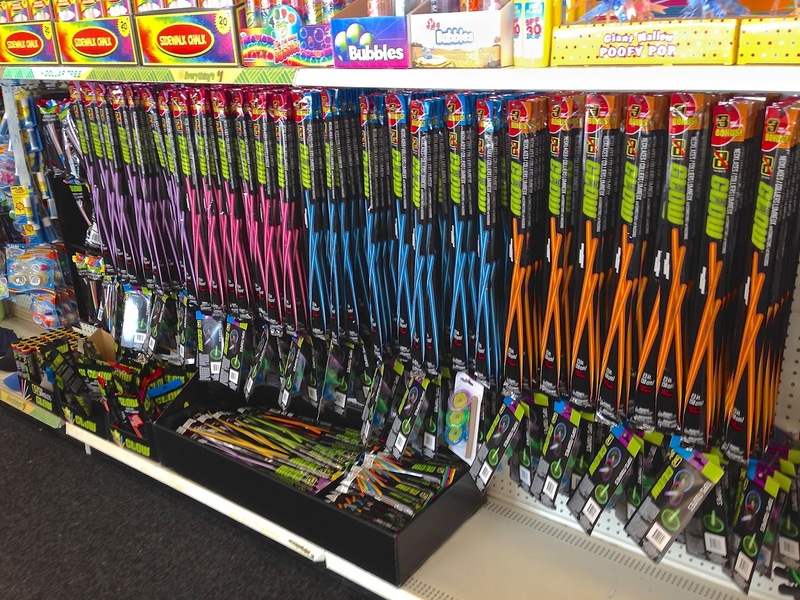 That's the problem with the dollar store, you think "but it's only a dollar" and then you get up to the counter and leave thinking "did I really get 20 items?" Fortunately, I didn't get that carried away and managed to keep the damage to a minimum...aside from the obligatory Harribo Gummy Bear purchase. They get me EVERY time. I digress. And this wasn't even all of it. Later on, I found a section that had three times the selection! Saturday was relatively tame. Michelle headed off early to get in a run with her friend Shannon, which gave me the perfect opportunity to be productive. I spent most of the day "doing schoolwork" and by doing schoolwork I mean I was editing a video from making pizza Friday night. At least I was productively procrastinating rather than just sitting around watching TV. I did make a trip down to the farmers market to pick up some delicious bread. Prepare for a tangent. I grew up loving bread. On my last and only trip to Germany as a Siemens employee, I had the privilege of traveling with a German colleague who lived in the US and professed her love for dense-hearty bread whenever she returned to Europe. I thought it was interesting her comparison of how "most" American bread is airy and fluffy but the bread in Europe is more substantial, more of a meal than a side, kind of like a good stout beer. I think she'd be proud because that's the type of bread I bought on Saturday. Gillie thought the bread smelled delicious! Although the loaf looks small, it must have weighed 2+ pounds. Think about that. It was delicious. I suppose this is me professing my love for dense-hearty bread. I guess you could say that I'm a convert. Anyways, I always try the bread from Sweetwater Baking Co. but this is the first time I've purchased. I don't know if I can go back. Although, I do like making bread in the bread machine. Right. The race report. Yes. I remember now. The only area for improvement by race management in my opinion, and this may be entirely my fault for not being more conscious, is communication of packet pickup details. I completely glossed over the details when turning in my registration. Fortunately, whomever is in charge of the RunAbout sports Facebook page is GREAT about replying to posts in a timely manner and that is where I found out that packet pickup ended at 7:45. Michelle really saved me here, as she always does. She was already at the Summer Solstice fest with some of her friends from school and swung by and picked up my race number, otherwise I would have been in a huge rush to make it by 7:45. 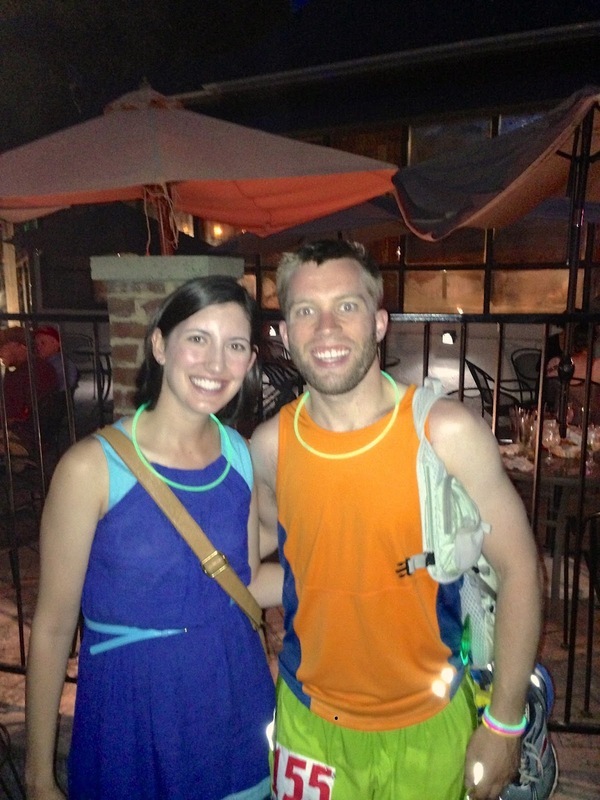 I decided I would run down to the start of the race from my apartment and packed up my Nathan hydration vest with my Chacos, for after, and surplus of glow sticks. I found Michelle a little after 8 at Cabo and pinned on my race number and headed off to warm-up. I usually don't warm-up, mainly because in a marathon or ultra I'll be out there for hours and that happens in the first few miles but I decided with a short race that I should try to "prime" my body for the effort. All glow stick'd up! Can you tell I don't take myself too seriously? I was feeling good and excited to race, despite what I had told other people about just taking the run easy. I wanted to see what I was capable of and what type of time I could put down but I also try to stay humble and understand that sometimes you just have off days and have to take it in stride, pun intended. I found Michelle at the start line with some Blacksburg friends and hung out for a few minutes before finding a place near the start line. I situated myself about 15 feet back from the start line, again mainly a humility thing, but I should've just lined up on the line as there was some initial side-stepping as a result. And without much buildup and a simple Ready. Set. Go! we were off. Most of the first mile is along Draper Rd. heading away from Downtown and is predominately uphill. The race sorted itself out quickly, or rather the Draper hill did, and by the first mile I was sitting within the top 15 or so and feeling comfortable (read: not feeling like I was going to barf). I began marking people and closing each gap, giving encouragement as I came up alongside them, although I wasn't in much of a state to talk as I was not running at a conversational pace so it was more like "Nice *gasp* Race! *gasp*" As we made the turn onto the Huckleberry Trail, I had that feeling in my legs and I began thinking "can I sustain this?" I think the mental gains that I have made this spring by running longer distances and off-road far outweigh the physical benefits. The most significant of which is the ability to push through tough moments in a race. Knowing the course well was a huge advantage as I knew exactly what to expect and prepare for around every turn. Turning off the Huckleberry trail (~2.2 mile-ish) and making a right onto Preston, I knew there was only three more hills before the downhill to the finish along Draper. I felt good and continued to push the pace and was able to catch, match, and pass two other runners in the last mile or so. The whole way down Draper I was thinking "Don't. Get. Caught!" 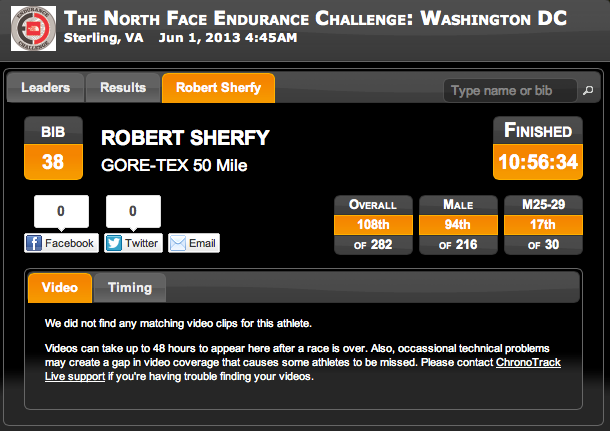 as I knew I would be kicking myself if I slipped out of the top ten for slacking near the finish. A couple hundred meters from the finish I could hear the sound of the vuvuzela (Nice Ultra VT!) and kicked to the finish, while retrieving my glow stick wand that I had stowed in my waistline for finish photos! Gorgeous night for a run! I suppose my mind was frazzled from the race or possibly in oxygen debt and completely forgot about the awards after the race. It was not until the results were posted Sunday evening that I realized I had taken second for my age group. I finished with a time of 19:50, which I was really pleased with especially considering I don't do speed work or track workouts. I placed 9th overall out of 231 but the field this year was less competitive than last year where I would have been 17th with my time. I was happiest that I didn't fade as the race went on with mile splits of 6:37, 6:26, and 6:18 for the 1st, 2nd, and 3rd miles respectively. Although, I think it helped that the last 1/2 of the race is downhill! We hung around and watched a few people finish but both of us wanted to enjoy the festival in its' entirety and what better way then to enjoy a refreshing beverage at Cabo! Michelle and I post race at Cabo Fish Taco! I didn't eat much after lunch because I was worried about my stomach. Great decision! 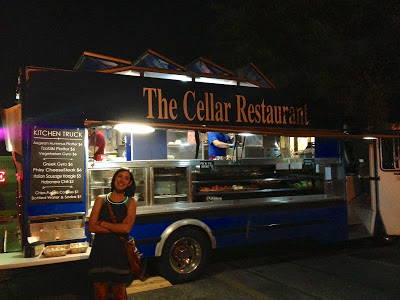 After the race, I indulged in a wiz wit (yes, with actual cheez-whiz!) from the Cellar food truck. 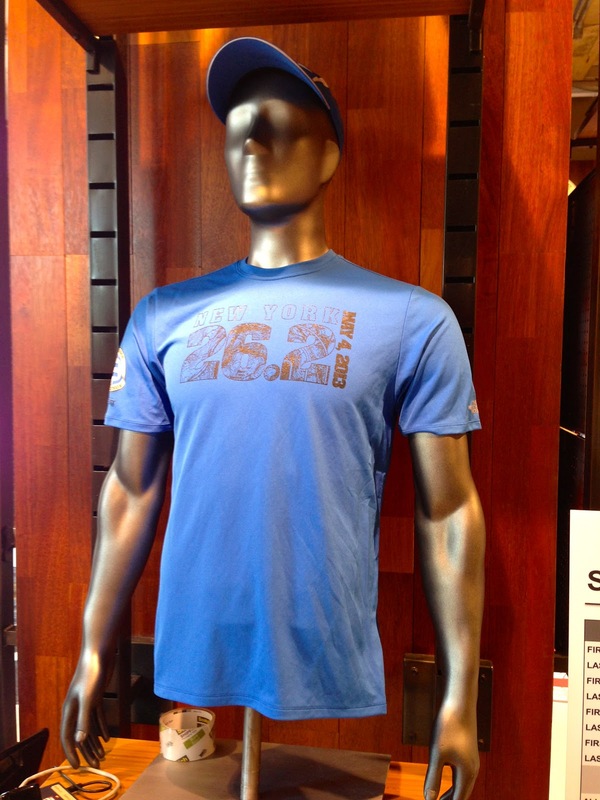 I love the race shirts, which is funny because it's not anything special (i.e. a technical shirt with wicking fabric) but the colors just make it feel like summer but I did have an observation about them. Do you think the person designing them was enjoying a Bell's Oberon at the time? The colors are almost exactly the same, despite the picture at the right. Regardless, they're AWESOME! It was a really fun race and I enjoyed the change from slow pace of an ultra. Maybe next year I'll convince Michelle to run it too! My second place age group medal! Posted by Unknown at 10:43 AM , Links to this post , 0 comments I'm reading from MyDailyGround: Downtown Sundown 5K - Race Report Tweet this! Where's Waldo Wednesday - The point of the week where more is behind than ahead and the weekend, and thus playtime, is the bright light at the end of the tunnel. Why did I call it Where's Waldo Wednesday? No particular reason really...other than I like alliteration and it is fun to say. Try saying it five times fast! A weekly (more like biweekly) series of what's new around here and other ramblings like things I found interesting on the internet this week or cool runs I did, kind of like a weekly synopsis. Originally, I was going to do this on Sunday and call it Sunday Synopsis but then I couldn't decide between Sunday Synopsis and Sunday Summary...so I did the only logical thing and decided to write it on Wednesday? This week's edition encompasses...ermm...June? so it's somewhat of a month in review so far. Also, that means this post is probably WAY too long for you so you may just want to skip through to options of interest. Honestly, there hasn't been much going on around here the past few weeks so I really don't have a whole lot to post about. Michelle and I have been enjoying cooking and I feel like we're finally finding our niche of what we like to prepare/cook/eat. One observation is our gradual shift toward a more plant-based diet. I don't really have an interest in pursuing a vegetarian or vegan diet, or labeling our eating habits for that matter but instead focusing on eating foods as close to their original state as possible. I've persuaded Michelle to try a vegetarian diet next spring just as an experiment to see what we think of it. 1. Learning to run again. Well. It feels like I am at least. 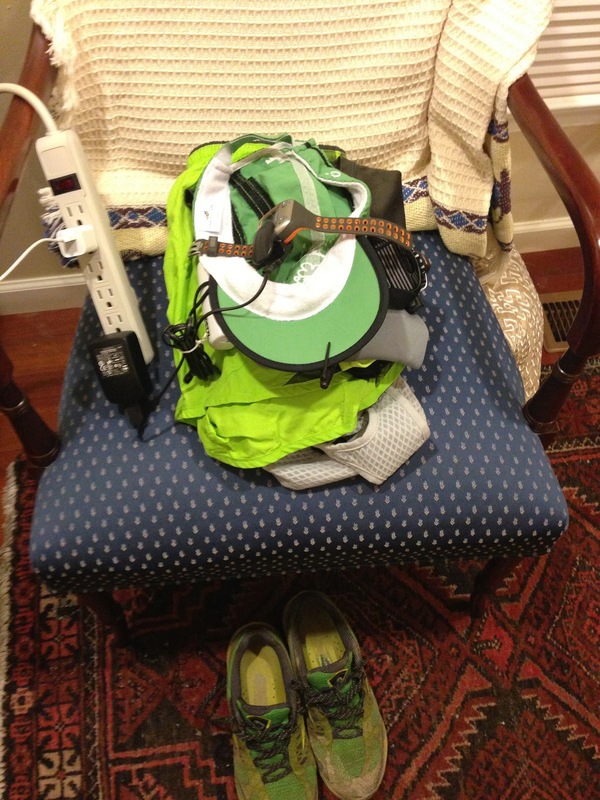 The arrival of warm weather has forced me to adjust my expectations when heading out for a run. I learned this first hand last Thursday when I went out for a longish run in the morning that left me feeling humbled, and destroyed by the end. It was the first double-digit distance run I had attempted since TNF 50 earlier this month and I knew early on in the run it was going to be rough day. It was apparent that skipping breakfast, aside from a yogurt, and a measly dinner the night before had put me in a calorie deficit which caused me to run out of energy quick. Fortunately, I had received my June StrideBox a few days earlier and decided to bring along a few items from it, which without I would have been in serious trouble. Welcome to Bonkville. I downed one of the green citrus chews below and began to feel better within a few minutes and continued along the Huckleberry trail out to Christiansburg. On the return, around mile 8, I was feeling empty and defeated and began to walk. It's easy to beat yourself up when you get into one of these situations. I was thinking to myself, "I ran 50 miles two weeks ago and now I can't do 8?" I'd be lying if I said I was positive the entire time but I try to keep things in perspective and appreciate the opportunity of the present and kept telling myself, "if it were easy, everyone would do it" and "it's the hard days that prepare you for tough moments in life." Eventually...I finished the run and hopped on my bike to pickup groceries and race the storm home, narrowly escaping the epic downpour! Details of my tough run. 2. Enjoy the moment. It's been a slow progression for me and I still battle daily/hourly to simply slow down and enjoy the moment. I think as a goal oriented individual it is difficult not to look to the future and simply enjoy being in the present. 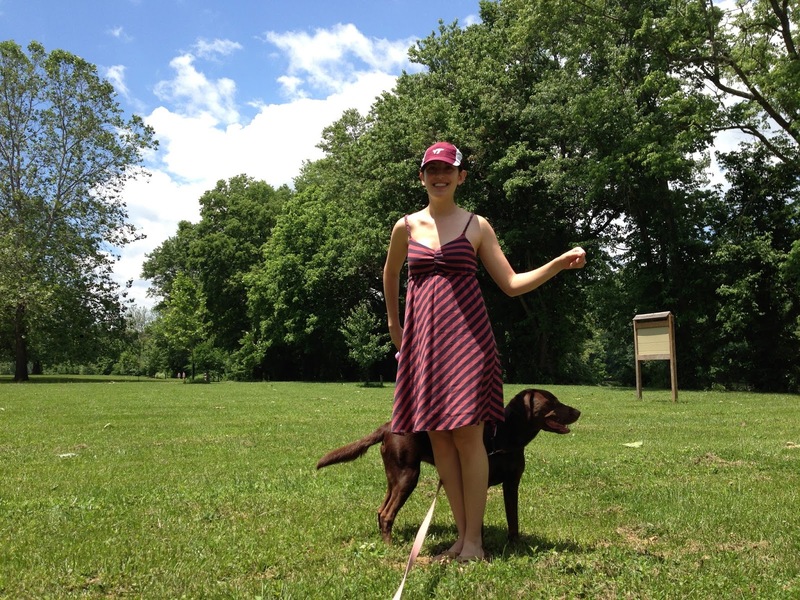 On Friday, Michelle and I enjoyed a relaxing morning before taking a picnic lunch to Bissett Park. We enjoyed just laying around in the sun and the gorgeous weather the day had to offer. It was fantastic practice for being content with the current and not thinking about everything that "needed to be done." 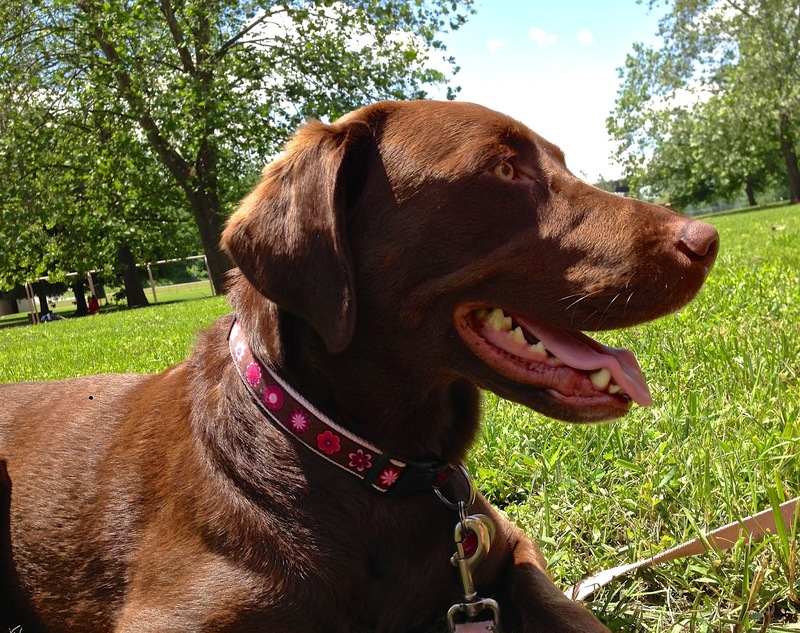 We brought Gillie along which we don't always do and really need to be better about. It's super easy to make excuses or not want to deal with the additional effort of packing a few bottles of water for her but the payoff is huge. She's an outside dog and to see her so happy is totally worth the extra five minutes...and the occasional constant untangling of the leash from our chairs. 3. 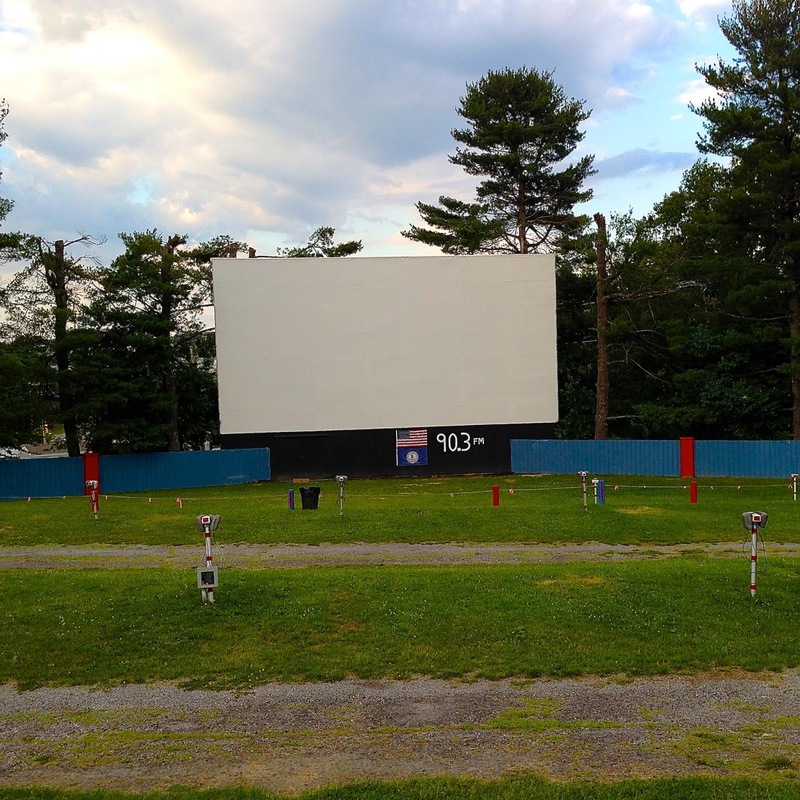 Starlite Drive-In - Furious 6. 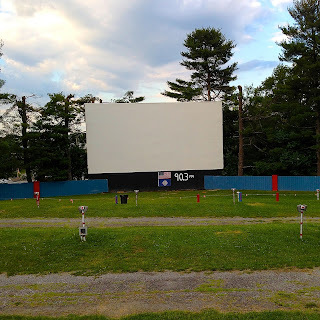 With the upcoming switch to digital projectors from 35mm, Michelle and I figured we needed to see a movie in a drive-in before there weren't any around anymore so on Friday evening we headed just down the road to the Starlite Drive-In in Christiansburg to see Furious 6, the sixth installment in the the Fast and Furious franchise. They have two showings a night, with the first beginning around 8:45ish and the second immediately upon the conclusion of the first. 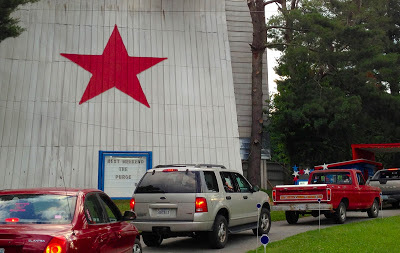 The entrance to the drive-in. The screen is actually on the back of the large structure with the star painted on it. The shot above on the left is the screen, obviously this was early on before everyone else arrived which made for a clean photo opportunity. You can either tune your radio to 90.3FM to listen via car stereo or use the speakers that you can hang on your door (above right). We opted for the latter and decided not to put it on the side of the car because the volume was high where it was. 4. 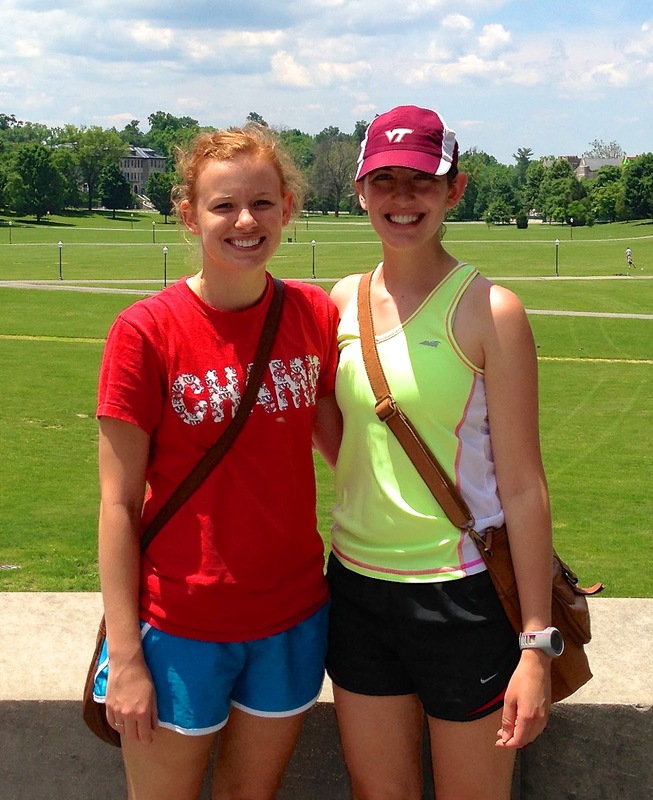 Early morning run and enjoying Blacksburg. I was struggling to get out of bed Saturday morning, especially after Thursdays demoralizing 12 mile run. I find that previous statement funny. When you think about it, the fact that I have the ability to run 12 miles at a whim even if it was at roughly a 9 min and change pace is nothing to scoff. I think we put unnecessary pressure on ourselves all the time. Breathe. Enjoy the moment. I managed 8 miles and felt good for most of the run which was somewhat redeeming. We headed toward Blacksburg to visit the farmers market and then stopped and grabbed a bite at Moe's. Afterwards, we walked around campus and showed Shannon, Michelle's friend from Radford, some of the cool things on Tech's campus. Michelle and Shannon at the Pylons overlooking the Drillfield. 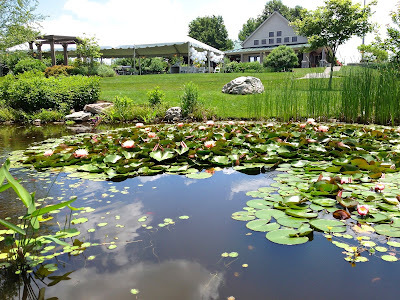 We headed over the Hahn Horticultural gardens, which are neat but we never make the time to get over there so it was nice to see everything in bloom. 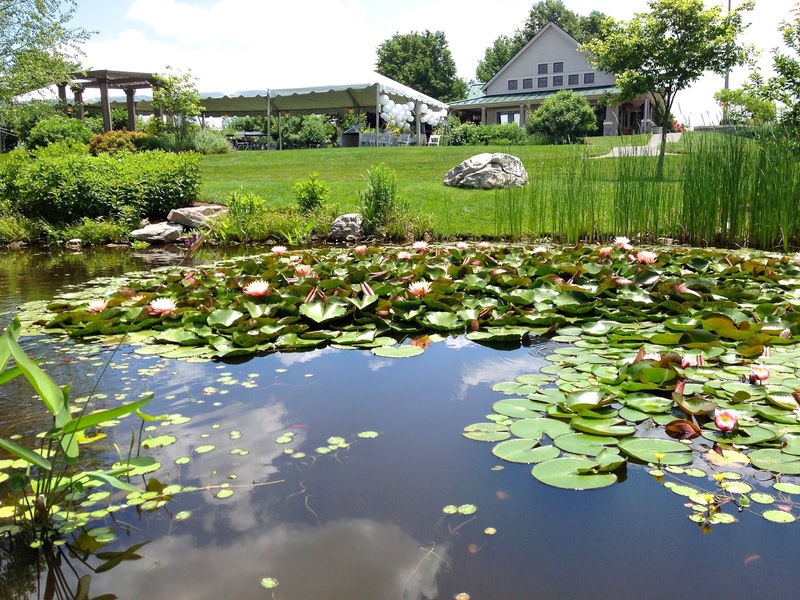 We noticed immediately upon entering they were setting up for a wedding and what a gorgeous setting it made. However, I felt bad for the folks who were going to be sitting through a wedding with the TERRIBLE gnats that would not leave us alone while we were there. We ventured down to the little pond and checked out the tent they had set up and were in the process of decorating. Lily pads in the Hahn Horticultural Garden. 5. Foodography. It's no surprise that I like to cook but I always take photos of the food and feel it never does the meal justice to how it actually looks on my plate. The colors always seem to be off and the entire meal just looks kinda...blah. I would say that I make a good effort to plate food in an exciting and visually appealing way and have been taking lots of photos trying to figure out what I think looks good. I'm happy with how the photos below have come out and hope that they will drive me to improve, both in cook/plating and taking the photos. I'm all ears for suggestions...and all stomach for suggestions too! I've been a bit of a wrap addict lately. They take practically no time to prepare, under two minutes, and I can pack lots of good tasting, and nutritionally dense, food in a non-messy portable-handheld. They're AWESOME!!! And they photograph well too...or at least I think so. The chips...well...yeah. I have tried to cut out all things in the past and I always binge or overeat on something else. These were the Kroger brand organic sweet potato chips. They're delicious. The side was just some plain greek-yogurt with bananas and blueberries and a dab of agave over the top. Why am I writing all of this? 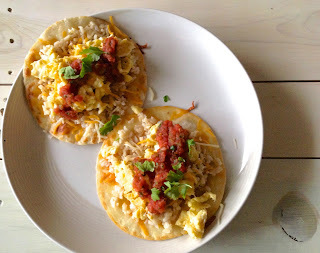 Because when I first tried to be aware of what I was eating, or how I still feel on some days, is that it take too much effort or cost too much or yada-yada yaya. It doesn't. It can be quick and simple and most importantly. Cheap. I use the Mission brand wraps, I'm sure any will do, and put them between two wet, not damp, paper towels and put it in the microwave for 20 seconds. I spread some type of hummus or spread on the wrap which helps the wrap stick to itself and keeps everything sealed, although as you can see in the photos above I need to more toward the edges. Next, I place spinach down as a moisture barrier between the wrap and hummus and everything else, which I think helps if you plan to not eat it right then. I have been cutting thin slivers of a red bell pepper and using a peeler to make thin shavings of carrots which give a nice texture to the wrap. I put on cheese and lunch meat and then seal it up. I've found that I like the fold the sides in method and then start rolling to get a nice burrito-like roll. 4. Self-portrait running photos. It's not as easy as one might think. Especially if you want the photos to be somewhere remote along your run because then you have to haul the camera with you and that presents a whole new challenge. I've had a Gorillapod for a few years now but rarely make the effort to use it how it's intended. The neat flexible digits allow you to wrap it around or position your camera on almost anything which is cool in-and-of-itself. I thought the graffiti on tunnel in the photo below would make for a cool addition but it's hardly noticeable. Anyone have suggestions? Granted I was using the Panasonic TS4 which is a great camera but I'm not sure I had it set properly for taking this type of photo. I decided to try a different location, which was actually just on the other side of the tunnel but actually used the Gorillapod this time and place the camera along a fence post. meh...so it was a valuable learning experience. 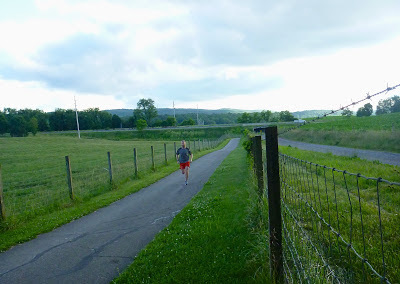 I think one thing that is neat is the opportunity for other folks to see where I run. On Tuesday, I registered for the Summer Solstice 5K, which is a run put on by RunAbout Sports that begins at 8:30PM this Saturday. $19 is difficult to beat for a registration fee and I think it will be really fun to run at dusk...glow sticks are provided! 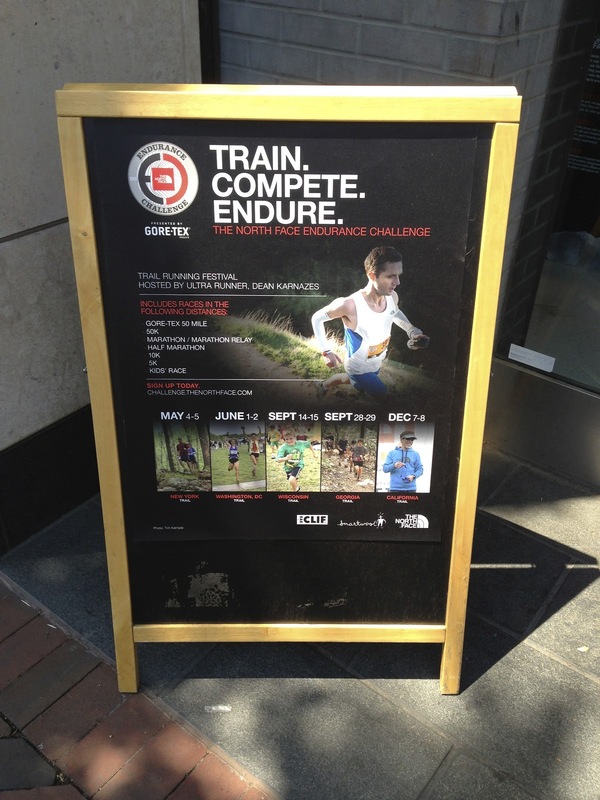 From Addict to Ultra runner Western States is this weekend, which is pretty much the Super Bowl of ultra running. I'm a huge fan of reading memoirs and stories triumph so I thought this article was a great read (and not too long) from the 2012 winner, Timothy Olson who runs for Pearl Izumi. Read it HERE. GO. OUT. and. RUN. At least that's how this video makes me feel! Talk about a close encounter! This is absolutely frightening! 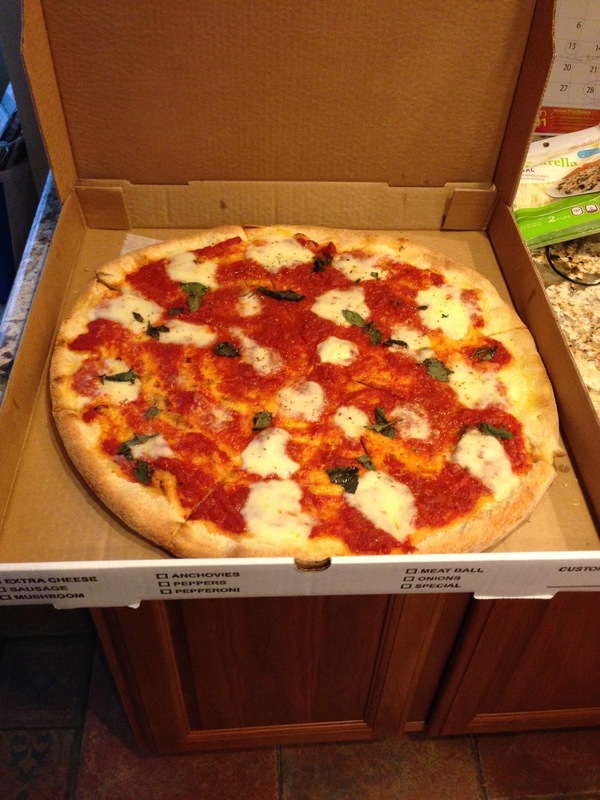 It's no surprise that I love pizza and Michelle and I make it pretty often around here but there's something about having a pizza delivered to your front door...but this brings a whole new meaning to carryout or delivery! Posted by Unknown at 5:41 AM , Links to this post , 0 comments I'm reading from MyDailyGround: Where's Waldo Wednesday - 6/?/13-6/19/13 Tweet this! 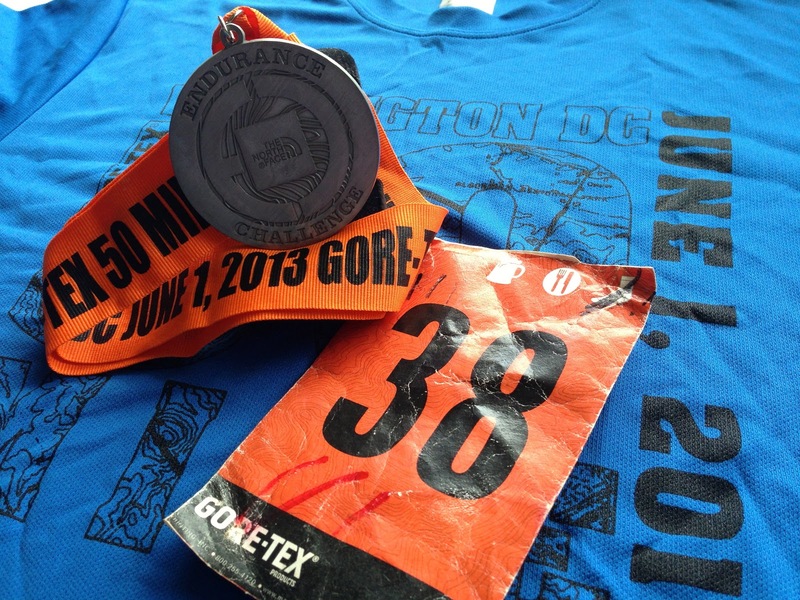 The North Face Endurance Challenge 50 Miler Race Report - Washington, D.C. The race started at 5AM in the dark and a runner was hit by a deer within the first half mile. It was wicked hot and humid. I'll never look at ice the same way. I managed to finish in 10:56 averaging a pace of 13:08 over 50 miles. For a long time, I have considered writing a post about biting off more than I can chew and not recognizing my limits. Then I realized the previous statement is a load of crap and the only limit is the one you set yourself, thanks Felix! And yes, we're on a first name basis. I have always had a great deal of confidence in my ability to push said arbitrary limits with the exception of running. I suppose you could say that I err on the side of caution when it comes to knowing where my limit is and going right to the edge but not crossing it. 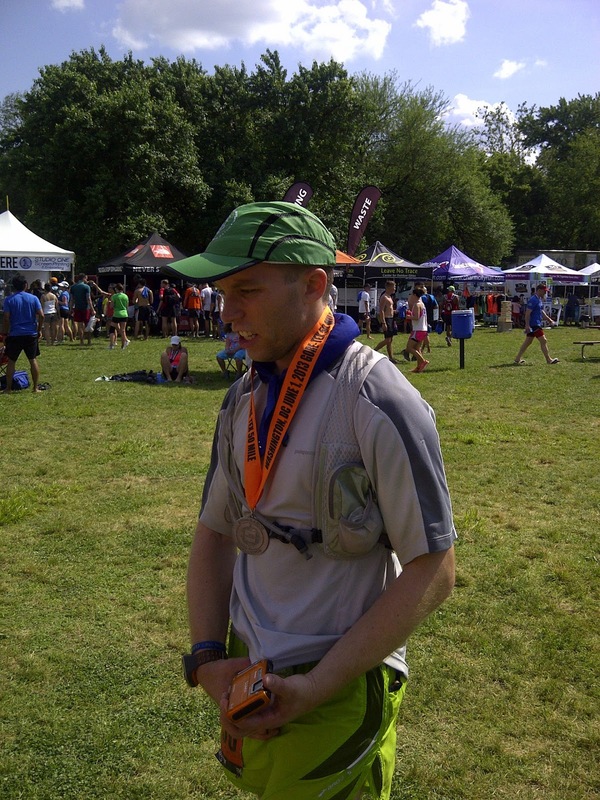 I believe completing The North Face Endurance Challenge 50 miler this past weekend was me taking that leap of faith (in myself) and crossing that line. The leap from 50k to 50 miles is big, especially when compared to making the less significant step from the marathon (26.2 miles) to 50k (31.1 miles), or said another way you're adding nearly four times the difference 4.9 vs. 19.9 miles. That being said, I think that Promise Land 50k++ (34 miles) helped me prepare for the leap which in hindsight doesn't seem as significant...but hindsight is always 20/20. The North Face Endurance Challenge was by FAR the most expensive race I have ever participated in but not because of an outrageous entry fee. No, I can blame this on no one other than myself. Similar to last year, when I initially registered for the North Face Endurance Challenge this spring, I again registered for the 50 miler ($116.50) but quickly let the stress of such a large undertaking, in combination with a challenging spring course load get to me and dropped down from the 50 miler to the 50k, incurring a charge of $11.50 to change registrations. After completing Promise Land in late April (which is a challenging 50k with nearly 8000' of elevation gain), I felt more comfortable in my ability to endure 50 miles and decided to re-up my registration. However, the cost was now growing unreasonable and I was hesitant to spend the additional $28 to change my registration but I eventually caved. All told, I spent $156.25 on the a race ($116.50+$11.50+$28.25) which should have only cost $116 but I suppose that is better than registering and not being able to run it, or even worse not finishing it! I was extremely pleased with my training leading up to the race. Not because I felt that I had adequate mileage or was "well prepared" but instead because the journey was rewarding in that each week was uncharted waters. The excitement of hitting new weekly high mileage and completing long runs faster and further than in previous training was motivating and helped me stay focused through the duration of training. Also, I knew that 50 miles was no joke and while you may be able to suffer through a 50k on minimal or inadequate training, 50 miles demands a certain level of respect which I was not willing to challenge. Weekly mileage buildup to the race where miles are on the left. Now that I have somewhat set the stage for the race, maybe I should get to the whole race report thing. Classes started on Tuesday after the memorial day weekend with the schedule for my course being Monday through Wednesday from 4-6:50. This meant that I could head home on Thursday morning and relax for the better part of two days. I left early Thursday and completed the four hour drive home before noon, grabbing a quick lunch at home before heading out the door again to meet my mom to head down to Georgetown for packet pickup. As I mentioned in last years race report and I'll say it again just in case you're listening race organizers/directors, move the packet pickup to Tysons where there is also a North Face store, more abundant/cheaper parking and the store location is closer to the race start and therefore more likely to be closer to out of town participant's hotels. Just do it! I digress. 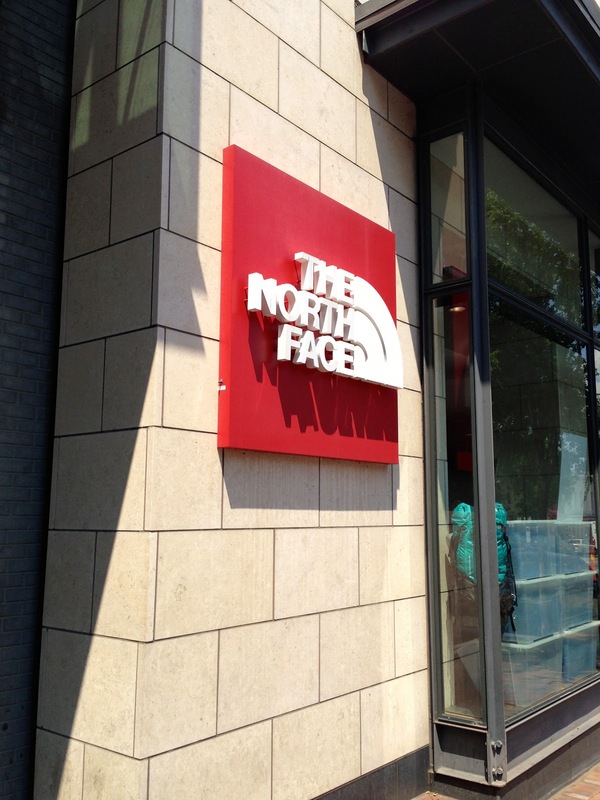 The Georgetown North Face Store. Washington, D.C. was the second race in the series, the first being Bear Mountain, NY and the final which is also the championship is held in San Francisco. There are also races in Wisconsin and Georgia! Of course there was plenty of North Face stuff available for purchase if your luggage didn't make it for some reason. The shirt that I hoped to receive at the end of a very long day on Saturday but the 50 mile version. Now, I'll say that the shirts are pretty cool, especially because each race distance shirt is unique, and I really like that they silkscreen them on-site but there is no way the shirt will look as good on me as it does on this mannequin. I feel like it's setting me up for failure! Packet pickup was efficient and they had plenty of folks helping but just not enough space...but I bet the Tysons store has more space! My mom was kind enough to drive down to Georgetown and this is actually the most economical of options, as the cost of a metro ticket and metro parking, of a single rider mind you, exceeds the cost of an hour parking at the Georgetown mall ($10, or $20 for any duration longer than 2 hours for future participants). The packet pickup didn't differ at all really from last year and we were in-and-out in 10 minutes. 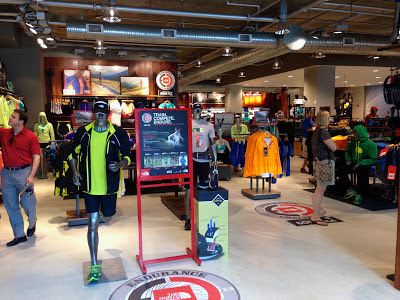 We made a successful stop at the running store a few doors down in my quest to find Rocktane for bottles in Great Falls Saturday and then browsed a few of my favorite home stores, West Elm and CB2, before heading home. 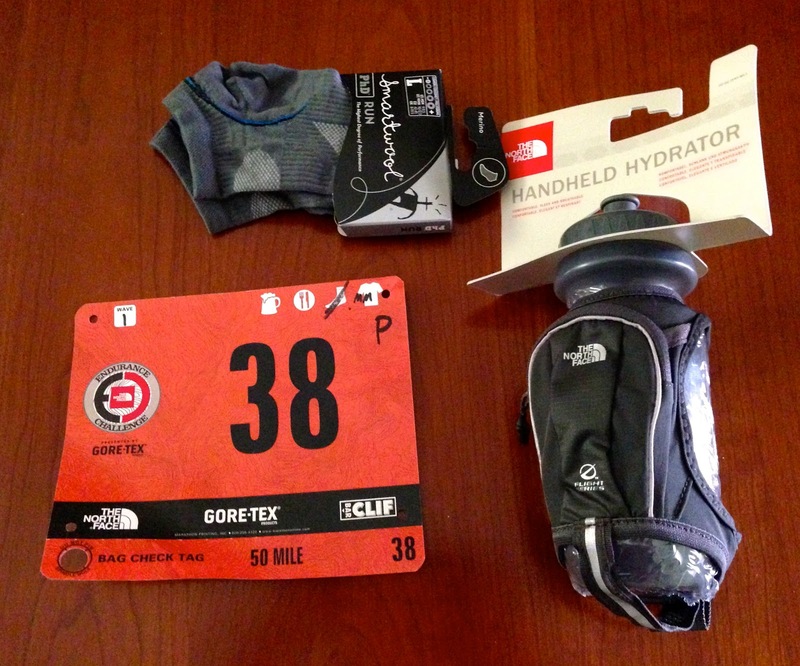 50 mile participants received a shirt (upon completion), a pair of Smart Wool socks, and a handheld. Also of note was that each of the four races for Saturday (the 50k, marathon, and marathon relay were also held on the same day) had different color bibs which made identifying other runners pretty easy. Thursday and Friday were very low key, I did my best to keep off of my feet and succeeded except for a trip Friday morning to get the oil changed in the Subaru and a quick trip to REI to pick up a couple Kool Ties in hopes of keeping cool on Saturday, more on that later. 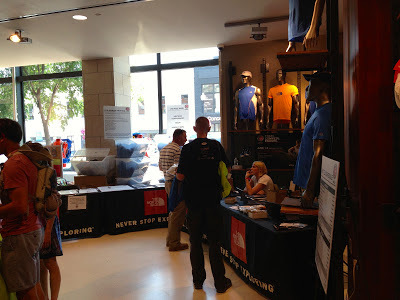 I stopped by the start line around noon on Friday and the North Face folks were busy getting everything ready. A stark contrast to last year when everything was tied down because of the crazy storms we had in the days leading up to the race. Per usual, laying out all of my clothes the night before to ensure I didn't forget something essential. Like to wear shorts. My alarm went off at 3:15 Saturday morning and the usual initial thought of "why in the hell do I do this again" was quickly replaced with anticipation and excitement for my first 50 miler. I ate my go-to breakfast of a toasted bagel topped with peanut butter, banana, and honey and enjoyed a cup of coffee before heading out the door around four. One reason I will continue to come back to this race year-after-year is the fact that the start, Algonkian Park, is 4.1 miles door-to-door from my parents house which is pretty darn tough to beat for convenience. The 50 mile participants have the privilege of parking at Algonkian while all other athletes must take a shuttle over from Loudoun Tech Center which makes sense with the early start time and is a nice little perk for those going the distance. Upon arriving, the starting line festival was buzzing with excitement and as I've mentioned in the past the energy at a race start is tough to beat and a large reason why I love "racing." I recently heard race day described on a podcast as a celebration of lifestyle which I think is terribly appropriate! The announcer talked for the majority of the time leading up to the 5AM start, most of which I chose to ignore except for his advice of applying sunscreen which I realized I had forgotten to do and thus returned to my car to complete. Starting the race in the dark. The parking folks did a pretty good job getting everyone into the lot and parked quickly but I had to laugh at the guy asking me if I was a 50 mile participant "No, I'm just here three hours early for the 50k. YES I'm a 50 miler!!!" The arch I would (hope to) see in just a quick 50 mile jog. A few minutes before five, the announcer called everyone in wave one to starting corral, which I was in, and introduced Dean Karnazes to a rather unimpressed crowd, at least compared the welcome he received last year at the 50k start line. Dean gave us a few words of encouragement and noted the high temperatures expected for the day and the importance of drinking lots of fluids. Less than a minute later the starting horn sounded and we were off and man-oh-man did things get exciting QUICK! 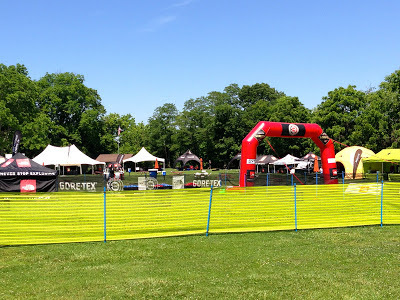 The start of the race makes a lap around a couple soccer fields that serve as the parking for the 50 milers and is surrounded by trees at the perimeter and high grass on the inside. The section of the course we were running on had been mowed and was between the high grass and the trees. Less than a half mile into the race or roughly 3/4 of the way around the soccer field, I noticed a noise off to my right that didn't sound like a runner, as it was moving too fast and cutting through the high grass, and I quickly made the connection that there was deer to our right and announced to the runners in my immediate vicinity "DEER on our right!" which what the hell are you supposed to do with other than "I hope it doesn't hit me." I slowed down and watched several deer cross about 20 feet in front of me before beginning to trot again thinking the coast was clear. However, I quickly realized it was not as I heard the same rustling through the grass and announced "DEER" just as I saw the deer jump out from the grass and take out a runner directly in front of me. For a runner, I guess your biggest concern is your legs and unfortunately the deer hit him directly in his right knee causing them both to fall to the ground but in hindsight I think this was the best possible scenario as if the impact was higher there would have been concern for a head injury. A few other runners helped him to his feet, all of us asking whether he was okay. He was obviously very startled but assured us he was okay and that he wanted to continue. It was much the like the long grass velociraptor scene from Jurassic Park 2...except with deer. The rest of the morning was rather uneventful, thankfully, and involved a lot of high grass singletrack before opening up to forest/fire road and entering Great Falls Park. The race required head lamps for the first couple hours but by 5:45 it was light enough that they weren't really necessary and I eventually decided to stow mine in my Nathan hydration vest around 6:30. I started the race with 64 oz. of lemon lime Nuun in my vest and finished the majority of it by the second aid station, mile ~8, and filled up with the Clif Shot mix they had as I knew putting away fluids was essential to finishing the day. The loop around the lake (think lollipop) on the way out to Great Falls, we would do the same loop MUCH later in the afternoon on the way back. Singletrack on the way out to Great Fall. I was soaked through pretty early in the race...as way my hydration vest which had my camera, which thankfully is waterproof but because my shirt was drenched it was tough to dry off the lens and hence crappy photos :-(. For a majority of the 14 miles out to Great Falls you run along the Potomac which makes for incredible scenery! I arrived at Great Falls aid station just after 7:30 (2:30 hours into race) to find my parents who were prepared to help me make the transition from hydration vest to handhelds. I prepared five bottles the night before with Rocktane, which I had not tried before but was willing to take the risk of trying something new on race day because of the expected high temperatures. 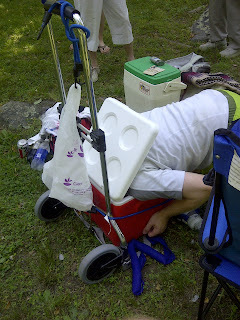 My parents had brought of all the bottles on ice in a cooler which proved to be crucial to my success later in the day. By 7:30, the temperature was well into the mid 70's and I was soaked from head to toe. Thoroughly prepared, I had several changes of shirts, shorts, and socks as well as another pair of shoes with my parents and let them know my plans to change. I decided to change out of the compression socks and trail shoes and into road running shoes which I think saved my feet because the Cascadias were pretty wet and could sit out in the sun to dry while I completed the three laps in Great Falls. I had forgotten how long the lap inside of Great Falls was (6 miles and change) and thought halfway through the first lap, "I have to do this two more times?" I reached the aid station within the loop after about 30 minutes and announced my concern that nothing looked appetizing which was a bad sign for my stomach. Thankfully they had ice which I added to my handhelds and trotted on down the course. The cold ice in my bottles really helped me continue to drink and revitalized me on the second half of the lap before reaching the Great Falls aid station for the second time to find my grandparents! After making the first lap in great falls! My awesome grandparents and mom! I recall reading somewhere that one way of lowering your body temperature quickly is to run your hands under cold water for a few minutes. I noted how MUCH BETTER I felt when the aid station worker had put ice in my handhelds and asked my parents to cram as much ice in the next set of bottles as possible. 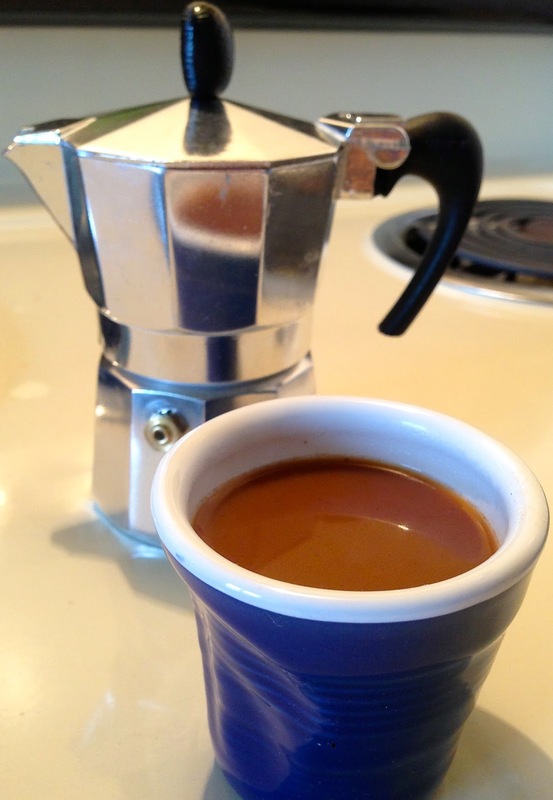 I attribute this simple step to my success and being able to finish the day. My dad was in charge of hydrating and changing the Kool Tie's I wore around my neck, another piece of new equipment I dared to try on race day whose effectiveness I'm not entirely sold on, as I came around each lap he would take the one I was wearing and put it in ice water and hand me the other. Each lap I would grab a banana as I left and a few potatoes with salt but the heat kept me from eating as much as I should have. However, the Rocktane is designed to be a calorie substitute with simple and complex carbohydrates and 240 calories per bottle so I don't think not eating hindered me too much. I was able to maintain my goal pace, 12 minute miles, during all three laps in the park putting me well on my way to my goal finish time of 10 hours. 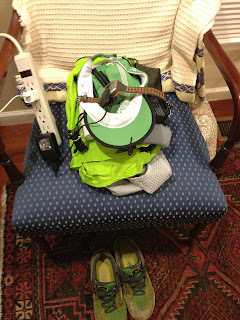 As I prepared to begin the 15 mile trip back to Algonkian I put my compression socks and trail shoes back on as well as a dry shirt and found myself really really hot despite all of the ice my parents packed into my hydration vest. Dunking my head in the cooler seemed like a good idea...at the time. I have to give a HUGE shout-out to my parents. I'm not sure I would have finished the day without them there. They did everything I asked and I wasn't always the most pleasant, thanks again! 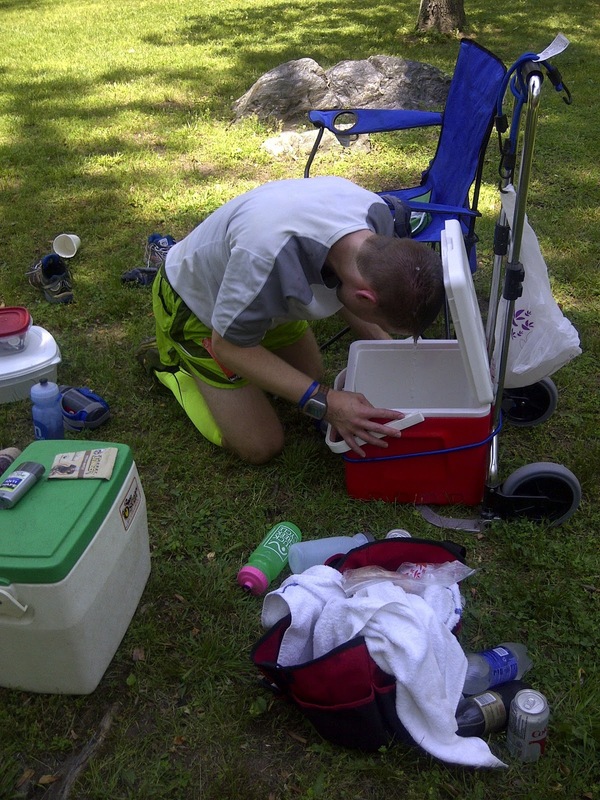 Dunking my head in the cooler after completing the last lap in Great Falls before making the trip back to Algonkian. It felt great until I went to stand up and realized all of the blood went to my head. That did not feel so great. It took me a while to get started after this. All told I probably spent 30 minutes at the aid station between the four times I was there. These folks had the right idea. I'm pretty sure they were runners but decided to take the photo after I had run by them so I can't say for certain. Unfortunately, my photo taking SIGNIFICANTLY decreased after this and the next photo...in fact I took zero photos after the next one. I didn't notice this tree on my way out but did notice coming home. It was just absolutely massive! The last photo I took before the finish. I kept the sub 12 minute pace until mile 38 when the heat really started to get to me and my stomach let me know it wasn't okay. Several runners stopped to ask if I was okay as I vomited a SIGNIFICANT amount of fluid including the cup of chicken broth I took as I left Great Falls. I assured them I was between violent-audible vomits. To say that I felt SO. MUCH. BETTER. after watering the immediate greenery would be a HUGE understatement. I simply had too much liquid in my stomach and my body was not absorbing any of it. Consequently, I think my temperature increased because of the fluid just sitting there and once it was gone I was able to put in cold fluid from my hydration vest and actually get my temperature under control. The next few miles were like a warzone with people sitting on the side of the trail and others laying in the middle of the trail cramping with other runners helping them stretch out. By this point there were 50k, marathon, and marathon relay folks on the course in addition to the 50 milers but there start times were much later 7, 9, and 11 respectively, which meant they were out in the heat the entire time. I gave some Tums to a guy who had cramped and was being stretched out by two other folks on the trail and my handheld, with some fluid in it that I had no intention of drinking because it was warm, to a lady who had been separated from the folks she was running with and hence had no fluids with her. The camaraderie of runners really showed through as the day wore on doing anything and everything to help each other to the finish. If the amount of people stopped on the trail was any sign of the rest of the runners, the second to last aid stations was a slap in the face of how damn hot, and more importantly humid, it was out. There were people laying on tarps with their arms over their faces and two other people laying in the bed of the volunteer/medical truck. They were out of ice and nearly out of Clif Shot mix but had enough to hold me over until the last aid station just another 3 or so miles up the trail. I grabbed two cups of Pepsi and headed down the trail to GET. IT. DONE...except it involved a lot of walking. Unfortunately, most of the last 10 miles were more walking than jogging. The last four miles are brutal because you have to do an out and back around a lake (think lollipop) which meant you were heading away from where you knew you needed to be and it was pretty empty for most of the way. 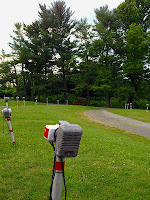 The good thing is that you pass the last aid station as you head out to start the lollipop and when you come back, although I only stopped as I headed out, they had ice which was AMAZING. You'd think I had never seen ice. I thought the 11 hour mark was out of reach upon starting out for the lollipop but realized upon returning when one of the aid station workers told me that the finish was 1.9 miles that it was possible if I picked up the pace. 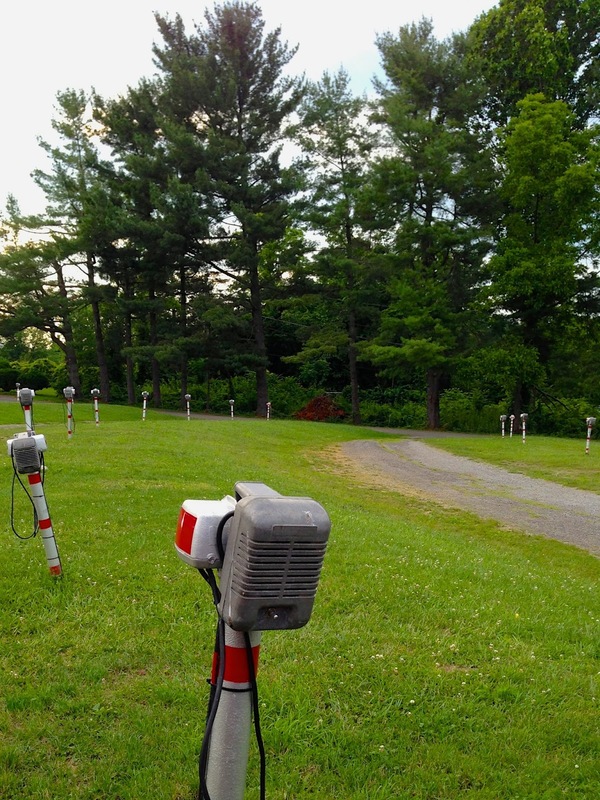 I started by making really small goals, first by jogging a couple hundred feet between tape markings. I then began looking off in the distance for anything to mark a good place to stop jogging - orange cones, spectators, and fences were all used. As I made the final turn onto the paved path that cut across the golf course I knew I was going to make it in under 11 hours and continued the walk/jog to ensure my legs didn't lock up a few hundred meters from the finish arch. I made one last goal ahead, a turn in the pavement, and told myself I would jog all the way to the finish. I was on pure adrenaline by this point and managed to pick up the pace to sub 10s which I hadn't seen since early on in the race. The announcer said my name as I went across the finish and I caught of glimpse of my parents as I collected my medal and tried to compose myself. I've said in past race reports, particularly after marathons, that the first five minutes after crossing the finish line are the worst because your legs are usually just in agony but my legs didn't really bother me very much. However, my stomach was a different story and let me know that it was terribly angry with me. I collected my shirt and took a couple finish photos before heading over to the ice bath to rest my legs in. Shortly after crossing the finish line. My face showing how I really felt. The signature two thumb solute. 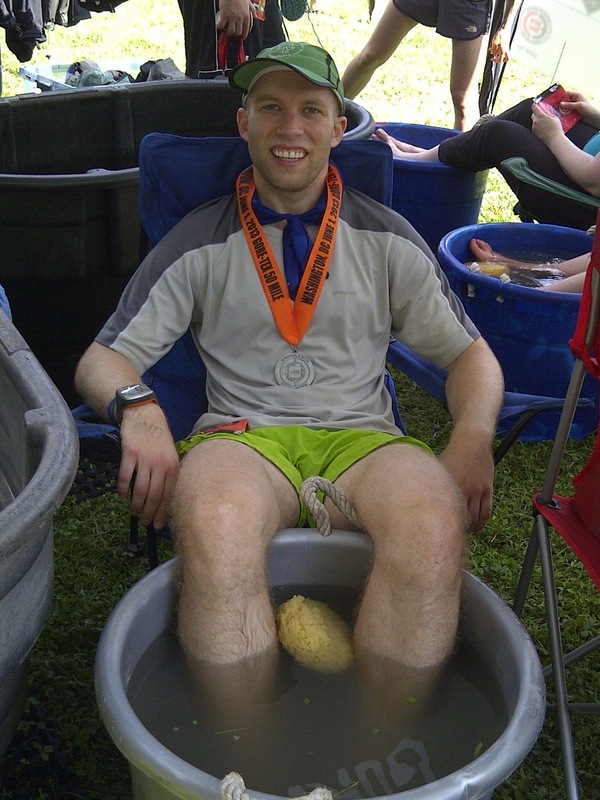 Last year I could not even keep my legs in the bucket it was so painful, granted I think the water was not as cold this year, but I handled it much better. We hung around the finish for awhile watching other runners come in. Eventually, I decided the heat was too much and my dad went to get the car which conveniently was just a short walk away instead of a bus ride back to Loudoun Tech Center. Later on in the evening, once my stomach had settled down, I uploaded my run to look at the race details and noticed that I had supposedly burned more than 8000 calories during the run...so I had no hesitation doing work on this pizza! 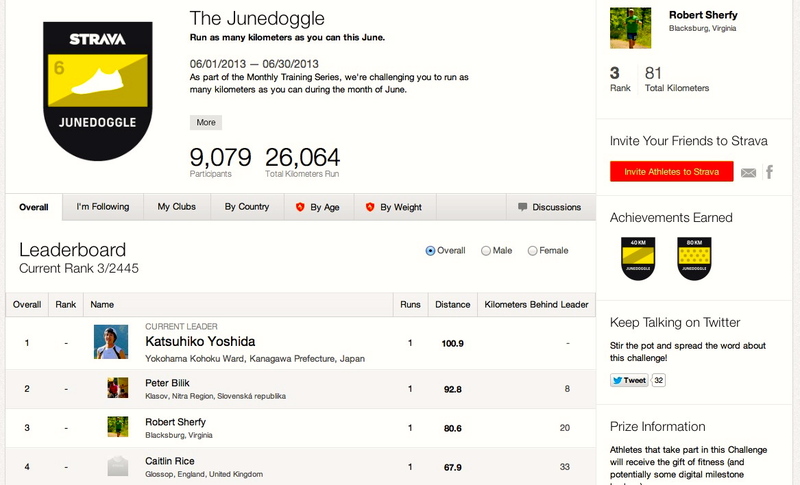 I use Strava to log mileage and track all of my runs and they had started a new competition on Saturday called the Junedoggle. 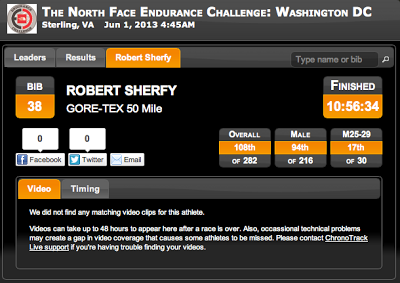 I enjoyed my brief moment of being at the top of just over 9000 participants with my 50 mile run for the day! 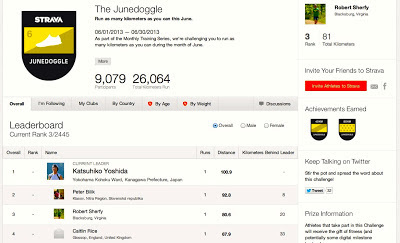 Third in the Junedoggle competition for a brief period! I took 108/282 for the 50 mile and finished with an offical time of 10:56:34! 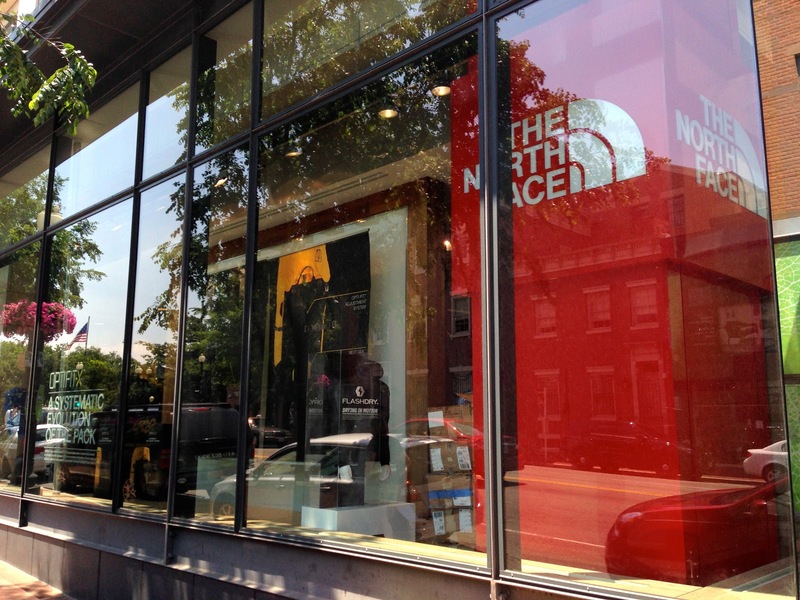 Despite the brutal temperature and humidity it was another phenomenal experience with the North Face series. 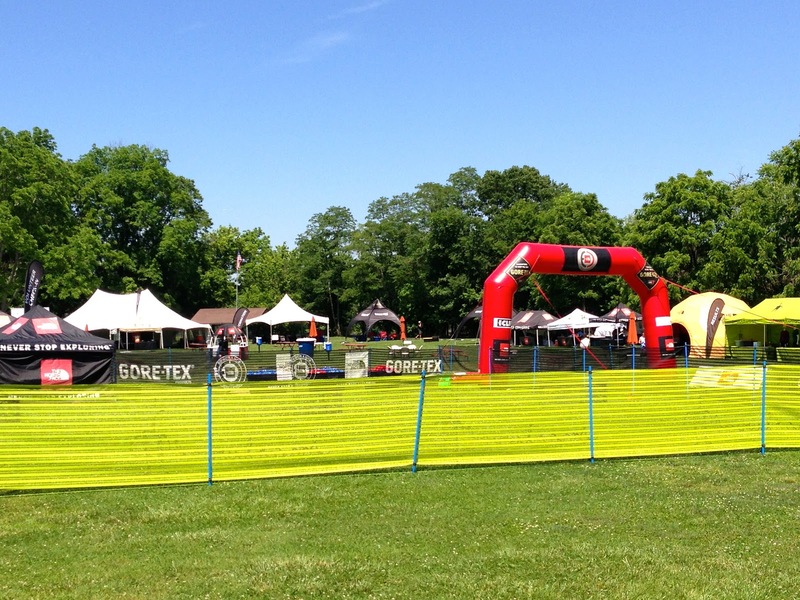 The course was marked VERY well, aid stations were well stocked, and the volunteers were INCREDIBLE! The three indicators of a well put on race. Nice job North Face! I'll be back next year...but lets do it in...say March? Posted by Unknown at 8:51 PM , Links to this post , 0 comments I'm reading from MyDailyGround: The North Face Endurance Challenge 50 Miler Race Report - Washington, D.C. Tweet this!